← Cell Phone and Cable American Express Membership Rewards Bonus Offers. 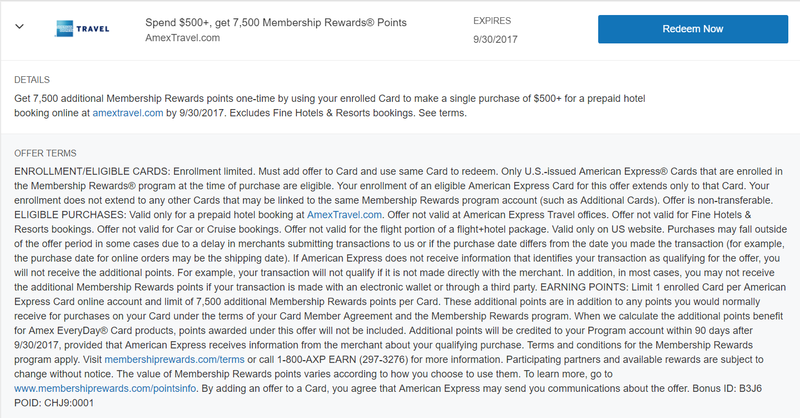 For a limited time you can earn 7,500 or 10,000 Membership Reward points for bookings of $500 or more on AmexTravel.com. This offer does not including bookings through Fine Hotels and Resorts and certain other transactions. My points offer is for 7,500, but others have received for the higher amount of 10,000 for the same booking requirement. Scroll to the bottom of each of your Membership Rewards earnings cards and check available offer. Choose add to card to enable offer. Click the link provided link or go to Amextravel.com and log into your account. Search and finish the transaction with the associated card for that offer. 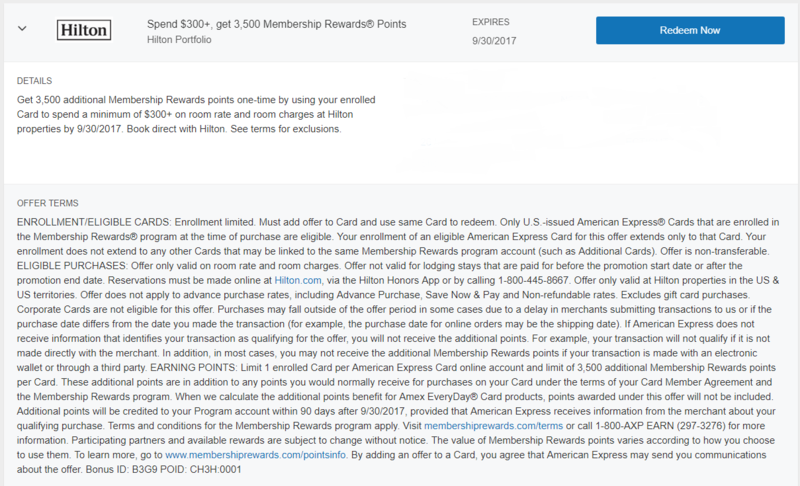 You can also earn 3,500 Membership Rewards points for spending a minimum of $300 at Hilton.com for stays in the United States and it territories. This offer expires on September 30, 2017. Certain rates and purchases do not qualify so please read Amex’s terms and conditions for this offer. Go to Hilton.com and log into your account.